Please accept my blessings. I beg to acknowledge receipt of your letter dated 17th August, 1971 and have noted the contents. There is no question of your falldown. Chant 16 rounds regularly and no power in all three worlds will make you fall down. Krishna will save you always. So you can live strictly like a brahmacarini and make advancement in Krishna Consciousness by chanting and reading the books. And you have got good capacity for preaching work also. There is no objection for you living together, but it is better that you live as brahmacarini. If you want to become a teacher for the young children, that will be very nice. Please accept my blessings. I beg to acknowledge receipt of your letter dated 13rd August, 1971 and have noted the contents carefully. So far your choice of artwork for BTG, I do not know the artistic sense. I am a layman and do not know the techniques. But the picture you have enclosed appeals to me, so it may be used. I have no objection. The point is that these drawings should be realistic. Not that you make Krishna a cartoon character and therefore laughing stock. And hippy ideas shouldn't be used either. Whatever technique is there, make it realistic. That will be nice. Please accept my blessings. I beg to acknowledge receipt of your letter dated 9th August, 1971 and have noted the contents carefully. I am so glad to hear that Krishna has provided you with a new temple very suitable for our purposes. So why not purchase immediately? If Karandhara is satisfied, then we can lend you part of the money for down payment and you can return it later on. So make arrangements in that way. Yes, if there are enough qualified devotees on hand to care for Lord Jagannatha, then certainly He should come there. So make nice arrangements for Him. If your facilities are as nice as those in L.A. then you can ask Babhrubahan to make big Jagannatha Deities like those in the L.A. temple. He carves very nicely and his wife Vikramini paints Them nicely also. When I was in L.A. last time, they carved one small set for me and the set is there in my room. If someone needs to receive Gayatri mantra, which is necessary for caring for Lord Jagannatha, then at your recommendation they can be initiated by mail. I will send you one tape made by me of Gayatri mantra. They should simply listen one at a time, privately, through the right ear and at the same time repeat each mantra, while reading it from one paper. You can also explain beforehand how to count on the fingers. Then, if the devotee is male, give the sacred thread. Then hold a fire yajna as you have seen done before. Send the thread here to me before the ceremony is to be held and I will chant Gayatri mantra on the thread(s) personally. So, if you can make your temple as nice as L.A. then certainly when I go to L.A. next time I will visit San Diego. It is only a 20 minute plane ride to San Diego from L.A. but it takes 200 minutes to get to the airport and back. Just see the conveniences of technological advancement. P.S. So far your getting married is concerned, it is better if you can remain brahmacari. Please accept my blessings. I am in due receipt of your letter dated 10th August, 1971 and have noted the contents. Yes, I received your Vyasa Puja offerings and the booklet was so nice. Thank you very much. It is very encouraging that you are getting prominent men of Calcutta to sign the invitation to Indira Gandhi. In the meantime I have induced the high commissioner in London to request her in the same way. So try to induce Indira Gandhi your best to attend the cornerstone ceremony. Why Acyutananda Swami should go to Delhi? He is supposed to be in charge of Mayapur affairs. Besides that he is purchasing some 10,000 bricks for constructing toilet rooms. He is supposed to remain in Mayapur and nowhere else. I have already written him in this connection. Rather Tamala should go with you. I have written Tamala also in this connection. So if you are not already started for Delhi, then make this alteration. Tamala should go for some time, not Acyutananda, to see to organizing Delhi center. Hamsaduta is in Hamburg and Syamasundara. is here with me in London. So far that money from Bangladesh program, I have no definite information. But don't be in a dream about it. Be practical and depend on Krishna. Please accept my blessings. I am in due receipt of your letter dated 12th August, 1971 along with the check for $10.00 as daksina. Thank you very much. Your ideas for toys are nice, but I don't think that is a very sound proposal. You have to engage your time in that way where you could better be selling magazines and books. That is better utility of your valuable time. Our Krishna Conscious children are not very much after toys and playthings. They are given from the very beginning beads and they are happy chanting in that way. So I don't advise you to do this since it will take up too much of your time. Anyway, do you think they would be saleable on the market? I don't think there would be demand on the general market for them. Just this morning I received your charcoal portrait of Srila Bhaktivinode Thakura and it is done very expertly. This means you have got special talent for this. So you should go on painting pictures of the acaryas. There are so many centers that they can be sent to. I think ___ you will find more facility because there you can have your own room for painting whereas in N.Y. already it is so much congested. Painting requires some solitary place. Anyway, if you think that you will want the association of the N.Y. artists then I have no objection if you go. Please accept my blessings. In further reference to my letter dated 14th August, 1971. I understand from Syamasundara. that you have engaged all our Sankirtana members of Amsterdam to work in a cigarette factory. I do not know how you could dare to do this without asking me or any other GBC members. Amsterdam is doing nicely in Sankirtana Party collections; why they should go to work in a cigarette factory? In your last letter to me also you tried to impress me that everyone should go to work. That is not our principle. Our principle is not to work like the karmi or under a karmi. We are not sudras. Sudras are meant for working under somebody, not brahmanas. If you do not know this principle, you should know it now. All our men living in the temple are basically brahmanas. Otherwise, why they are offered sacred thread? We should live on the paltry income, whatever we receive, by selling our magazines, but in dire necessity when there is no other way we may accept some service temporarily. But on principle we should go on Sankirtana, not work, and whatever Krishna gives us we should accept on that principle. You are a senior member of the society. You should have known all these things. Anyway, send them back on Sankirtana. All Amsterdam devotees should be engaged in Sankirtana, not in a cigarette factory. I beg to thank you very much for your kind feelings of appreciation of my humble service unto you. You are all helping me in pushing forward this mission of Lord Caitanya Mahaprabhu, coming down by disciplic succession to my Guru Maharaja. So whatever you have spoken, it is simply due to them. I am simply the via media to receive them, on behalf of my Guru Maharaja, His Divine Grace Bhaktisiddhanta Sarasvati Goswami Maharaja Prabhupada. Please accept my blessings. I beg to acknowledge receipt of your letter. So far your son leaving you, his parents, at 5 years, that is not necessary. Especially our Krishna Conscious children; they are already living in a asrama. The children of our devotees may live with their parents perpetually because you are all living in the temple and already engaged in devotional service. Other instructions are for those not engaged in Krishna Consciousness. Any family engaged in Krishna's service is living not in this material world. Such a home is considered as Vaikuntha. That is the verdict of Bhaktivinode Thakura. So if you are afraid of your husband's taking sannyasa, I shall not give him sannyasa order at any time. Be rest assured. Your husband is already a householder sannyasi because he has no other business than to serve Krishna. You can be living peacefully with husband and children and always engaged in Krishna Consciousness. One should become sannyasa by action, not by dress. In Bhagavad-gita it is said that any person who doesn't work for himself but for Krishna only is a perfect sannyasa and perfect yogi, never mind what order he lives in. That is the opinion of Lord Caitanya also. I have seen the picture clipping enclosed by you and it is very very nice. Please offer my blessings to your good husband Vamanadeva. I can see that our St. Louis center is doing very nicely. Thank you very much. Please accept my greetings. I hope you are doing well. I learned from other members of our society that you kindly sometimes visit our Mayapur center where we have already got one cottage. When I was in Calcutta we talked of purchasing more land. I am still prepared to purchase if we get bargain price or at least at the current local price but I have heard that people are asking more than the expectation. So conveniently you may go sometime at Mayapur and stay with our men and negotiate with persons. If they are prepared to sell the land at the right price, then I can purchase all the available land. My idea is to purchase land for agriculture so inmates may not depend on outsiders but grow food there and things may go on nicely. Please accept my blessings. I beg to acknowledge receipt of your letter dated 9th August, 1971 and have noted the contents. The article enclosed by you is very very nice and I have read it thoroughly. They are very much appreciative and it will help your Bombay branch very much because this paper has very good circulation. So far Mrs. Amersey is concerned, let her come down to 15 lacs and then we shall talk over the matter. Mr. Vakil, if he doesn't take the responsibility of vacating the tenants, we are not at all interested. So then you can close transactions. Regarding the corner palace, we cannot afford to pay 25 lacs. That is not possible. So far the apartment on Nepean Sea Rd. if the hall is twice as big as our present temple then we will prefer it. But what is the rent? That you have not said. Bhattiwala (?) creates troubles sometimes, so if there is a written agreement that we can hold kirtana, we can go there. So far Akash Ganga, we shall pay rent month to month because we don't know when Bhattiwala will give another turmoil. But unless we get a better place, we are not leaving there. That is a fact! I am very encouraged to hear that people are coming. So please manage temple affairs nicely. Nanda Kumar is expert pujari and his wife is already going there. The Deity worship must be done very very carefully. I have already seen how Nanda Kumar is doing and it is all right. Everything must be kept very clean. Yes, I shall like if you hold the benefit in my presence and I shall be very glad to see the college students taking part in that way. But they cannot present some demon rascal interpretation. Only selected candidates should be allowed to speak. That you will have to see too. This whole program is very novel and encouraging provided it is properly organized. Some way or other if the college students are induced to take to this Krishna Consciousness Movement that will be our great credit. But I am afraid that when they will be asked to give up the four sinful activities, immediately there will be some fall down. The money raised from this program will greatly help us to purchase Bombay property and also to develop the Mayapur scheme. Yes, we can hold in Madras a ceremony similar to the one we held in Bombay and Calcutta. In all probability I shall be in India by the end of September. Maybe earlier also because London climate is very much unsuitable for me. It is always damp, dark, and cold. So very soon either I will have to go back to N.Y. or towards India. Syamasundara is contemplating that we go to Switzerland. What is the climatic condition in Bombay now? Please accept my blessings. I beg to thank you very much for your letter dated 25th July, 1971 and have noted the contents. It is very encouraging that you are developing our Mayapur center very nicely. The fences are complete and now you are sowing some hedge plants. Do it nicely. I have seen the photos of the cottage you have proposed and it is very attractive. In the mean time I sent you one letter dated 7th August, 1971, about the article you wanted to write on Rathayatra according to the instructions of Bhaktivinode Thakura but I have received none. I hope you have already sent it. If not, send it now, but keep a copy of it. I am glad to hear that you are harvesting rice. The crop may be saved to utilize for our members nicely. Regarding the bricks, it is a very good idea that you have ordered 10,000 bricks but as soon as the rainy season is stopped we will build our temple. So we require many lakhs of bricks. So if possible, why not purchase them now and soak them in the water. Here in London we are planning a very nice temple and compound and two or three men will go to supervise the construction. In the meantime you can talk with local masons for the bricks and in my opinion you should stock more bricks. Yes, we were saved by Srila Bhaktisiddhanta Road. We shall always expect to be saved by His Divine Grace Srila Bhaktisiddhanta Sarasvati Goswami Maharaja Prabhupada. Always pray to His Lotus Feet. Whatever success we have had in preaching Lord Caitanya's mission all over the world it is only due to his mercy. I am so glad to hear that you are all feeling separation for me and similarly I am also feeling. Since I have seen the cottage it has attracted me to go there immediately and live with you for some time. Actually cottage life for chanting Hare Krishna Mantra is very nice but because we are dealing with the Western people, Americans and Europeans, they require some nice apartment. Therefore we have to construct a nice house for them. My Guru Maharaja's policy was to give nice facility to devotees so that they may chant Hare Krishna Mantra peacefully and make advancement. But we cannot be luxurious. As far as possible minimize the needs of our life but we shall not curtail the bare necessities. With great delight and interest I have gone through your ``Eight Verses in Praise of My Spiritual Master.'' The style is very nice and thoughtful. May Krishna bless you to improve more and more in writing the glories of our previous acaryas and the Lord. Be engaged in glorifying the parampara system and your life will be glorified automatically thousands of times. Thank you very much. Please accept my blessings. I am in due receipt of your letter dated 10th August, 1971 and have noted the contents. For the time being this measure of taking outside work may be taken up but the principle is that everyone should engage full time for various propaganda work of the Krishna Consciousness Movement and maintain themselves by the little profit made by book selling and literature distribution. Now we have got Isopanisad in German language. The devotees can better be engaged in distributing these books. Where is Mandali Bhadra? I have not heard from him. What he is doing now? What has happened to ISKCON Press Europa? Since I have come to London, why I have not heard anything from him? So far Krishna das is concerned, first let Krishna das go there to Moscow. You are in Hamburg already. There is no need of you both being there. You should stay there and develop that center. There is no question of your travelling just now. So let Krishna das go to Russia. He is very much enthusiastic for it. Please offer my blessings to the others there. Hoping this will meet you in good health. My blessings for Himavati. Please accept my blessings. Enclosed please find tape no. 14; S.B. 4th canto, 11th chapter continued. This is the third tape sent from London. Also please find one poetry enclosed for publication. I have just now received your presentation of slippers as an offering for Vyasa puja day. They are certainly very attractive. Thank you very much for them and offer my thanks and blessings to all the nice boys and girls there in Boston. There is a story about one man, a cook, who bought a nice new pair of shoes. But all morning long he was in the kitchen cooking and so he couldn't wear his shoes. Similarly, all afternoon he was cooking. So what did he do? At night, when he went to sleep he wore the shoes. So these shoes are so nice, but I don't know when I shall be able to wear them. So when taking rest at night I shall wear them. Please accept my blessings. I beg to acknowledge receipt of your letter dated 9th August, 1971 and have noted the contents carefully. I am sick here since the last four days. The climate here in London is not at all suitable for me. There is no sunshine. Almost always there is darkness and rain. So it has affected my health, because I am already rheumatic. I approached the high commissioner here requesting him to write a letter to Indira Gandhi to accept our invitation. He has already written to her and I am waiting the reply. As soon as I get a definite answer I shall leave London. If the reply is favorable then I shall go towards India, maybe visiting Switzerland for a few days. Otherwise I shall return to N.Y. It is proposed by the 15th September a meeting of GBC will be held there. We require to hold this important meeting of the GBC to formulate the rules and regulations how things will be worked on. Sometime there are complaints against the GBC which is not very favorable. I set up the GBC with hope that I shall get relief from administration of the mission but on the contrary I have become the center of receiving so many complaints. So it is not a relief for me, rather it is becoming a little troublesome. Anyway, by the grace of Krishna things will be settled up very soon. I am very glad to know that your trial balance and balance sheet of accounts are being prepared, but I am simply surprised why the professional accountant did not take up this matter first before proposing audit of accounts, because after writing to you about this trial balance, you then said that it is now being prepared. This matter does not seem to be very expertly handled. Anyway do the needful. Prepare the trial balance and balance sheet and mail them to me. Regarding Delhi, I was sending Ksirodakasayi Das to take charge because Subala Swami was not fixed up and I also requested both you and Gurudasa to go there. From Ksirodakasayi Prabhu I understand that the proprietor of the dharmasala has given in writing that we can stay in that dharmasala indefinitely provided we go on holding our classes, kirtana, etc. So it is very good that you have decided to go there. Ksirodakasayi may reach Delhi by the middle of September. In Delhi so long Ksirodakasayi does not reach, you remain there and organize the center very nicely with the help of Gurudasa, Subala Maharaja and others. As soon as he goes there you may return. It may be that your personal presence will be needed at the GBC meeting. I have no objection for Gurudasa becoming president. Our main business is to preach this Krishna Consciousness Movement. When American boys and girls push on this Krishna Consciousness movement, everyone is interested with this movement, not with what office he holds. So if Gurudasa becomes president, let him become so. 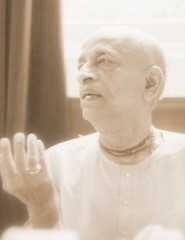 Then the post of secretary and treasurer may be divided between Subala Swami and Ksirodakasayi. That you can settle up when he reaches. In the meantime you organize that center very nicely. Regarding Acyutananda, he may not come to Delhi because I think his presence in Mayapur is necessary. I understand from his letter that he has already ordered some bricks for the toilet room. So for the time he may not come to Delhi. We have already submitted here for missionary visas and at least five men will reach India very soon. Nanda Kumar's wife has already gone. Visala Das Brahmacari is here on his way to India. Nara Narayana and his wife also are ready. I have already engaged Nara Narayana, Vasudeva and Ranchor to prepare a grand scale plan for the Mayapur land and as soon as it is prepared, Nara Narayana will go there. Bhavananda is coming here on his way to India. He will reach here on the 19th August. Bhavananda and Nara Narayana, they have got good experience in building affairs so I think if we engage professional masons and supervise the work ourselves, we can save so much money. There are many experienced masons and as I have already told you, they have already constructed Sridhara Maharaja's temple. So there will be no difficulty. So far Giriraja is concerned, he requires a little freedom to work. I think he should be given that opportunity. Please offer my Vyasa puja blessings to everyone of you. I am so much pleased with the book put together by you. It will be read tomorrow in the meeting. Similar publication was done by ISKCON Press. So I thank you very much, all of you, for appreciating my humble service which I am trying to render as a matter of duty ordered by my Guru Maharaja. I request all my disciples to work cooperatively and I am sure our mission will advance without any doubt. Regarding Ramananda at Gorakhpur, he is very important hand as Hindi translator. So I do not find any reason why Chopra or other members in Gorakhpur should complain against him. So things should be handled very carefully because everyone engaged in Krishna's service should be given a chance to exercise this transcendental business very nicely. I am getting older and the 76th anniversary of my birth observed by my disciples means that I am getting older. Naturally my health does not allow me to work very hard but still I am working as hard as possible to advance this mission and I request all my disciples to give their full cooperation in this great task. I have received one letter from Madhudvisa Maharaja. Things are going on nicely in Bombay. So please try to make another nice center in New Delhi by combined effort. Please accept my blessings. I beg to thank you very much for your letter dated 9th August, 1971. I have already chanted your beads and they are enclosed herewith. Please be engaged in the service of Lord Krishna very enthusiastically. You are my old disciple and I know how much enthusiastically you were working in the beginning at the old L.A. temple. Now you can revive the same old energy and develop San Diego center. Krishna is giving you a nice place to serve so utilize it properly. So far your service is concerned, you should understand that Krishna's service is absolute. Anything you do for Krishna in the standard of Krishna's service is Krishna also. So cleansing Krishna's temple and working on the altar of Krishna, etc. there is no difference. So don't consider in Krishna's service that something is higher and something is lower. Neither Krishna's servants are materially superior or inferior. So you should stick to your present service. That will be very nice. Now immediately we have got a very big project to construct a temple at Mayapur, the birth site of Caitanya Mahaprabhu. So you can contribute the sums for our Mayapur construction scheme. Sannyasis should not be given any money. They should manage themselves and maintain themselves by taking small alms from different persons--not a lump sum from one person. It is very much pleasing to me that you are so much sacrificing everything for Krishna. Krishna will surely bless you. You can open better a Mayapur construction scheme fund and deposit as much money as possible there and in due course we shall withdraw it. The estimate for the project is Rupees 40 lakhs (Rs. 4,000,000) which in ordinary exchange comes to $500,000. So you can deposit in this fund as much as possible. That will be very nice. Please accept my blessings. I am in due receipt of your letter dated 15th July, 1971 and have noted the contents. I am glad to learn that you had contact with my disciple Vaikunthanatha and his wife Saradia Devi there in Guyana. Presently Vaikunthanatha and wife are in Trinidad at the following address: c/o B.N. Singh; 258 Christian Drive; Plaisance Park; Pointe-a-Pierre; Trinidad, W. Indies, and are working very hard to push on this Krishna Consciousness movement in that part of the world. They are very sincere young couple and I am very much appreciative of the fine work they are doing there. Formerly they were in Guyana but when their visas expired, they were forced to leave the country, despite the local support. But I know that there are many people in Guyana who are wanting to see us establish one center of our International Society for Krishna Consciousness there in Guyana. They can be of great help; simply they must be organized. You are there and are very enthusiastic for us to go there also, so you can do a great service by gathering local support and do whatever has to be done to allow Vaikunthanatha and his wife, or any other of my disciples, to go there and establish one very nice center. That will be very nice service, and Krishna will surely bless you. Please offer my blessings to your wife and two sons. Hoping this will meet you in good health.